Brake pads for disc and drum brakes are most important elements of vehicle brake system. Brake pad consists of back plate and friction lining formed on it. If required, springs are fixed on back plate, which prevents noise of pads moving in caliper during driving. Friction lining material is a complex mixture which includes at least five components. One of it is non-ferrous metal facings for heat removing from contact surfaces of disc or drum. Back plate is manufactured from steel which is galvanized to prevent corrosion. 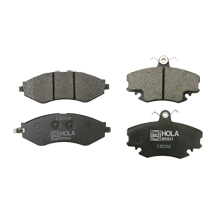 HOLA ™ brake pads correspond to Regulation №13 (GOST R 41.13-99) and №90 UNECE (GOST R 41.90-99) requirements. Estimated operating life of brake pads is more than 30 000 km run, of brake shoes - more than 70 000 km run*.